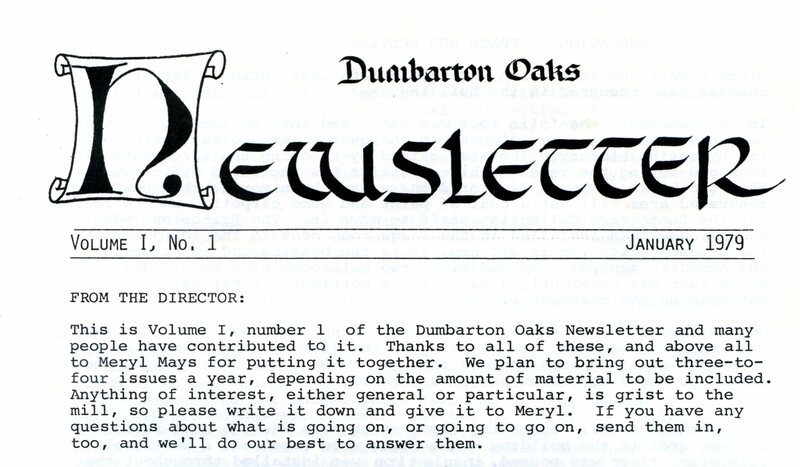 The newsletter that you are reading, The Oaks News: A Monthly Bulletin from Dumbarton Oaks, is the latest in a succession of news bulletins dating back to 1941 that have been published at Dumbarton Oaks. The Oaks News had its first digital issue in February 2012 and continues to be published monthly for the staff, alumni, and friends of Dumbarton Oaks in order to inform them of the institution's varied activities in all departments. Copies of all newsletters, both historic and current and both in print and digital formats, are preserved in the Dumbarton Oaks Archives. The earliest newsletter, the Underworld Courier, was a private publication produced by Dumbarton Oaks staff to keep the founders, Mildred and Robert Woods Bliss, then residing in California, abreast of developments and happenings at the nascent research library and collection. Twenty-one issues were printed between January and November 1941. A hiatus in newsletter production occurred between 1982 and 1994, at which time the Byzantine Studies program began publishing its own digital newsletter, first annually and later intermittently until its last issue in January 2015. Similarly, the Garden and Landscape Studies program initiated Landscape Matters: News from GLS @ Dumbarton Oaks in 2008. This annual digital publication occurs each fall. In July 2009, the first institutional digital newsletter was launched, In the Know at D.O., which was issued monthly until February 2013. And most recently, the Dumbarton Oaks Communications Manager began publishing a digital staff newsletter on April 14, 2017, the Director's Office Weekly Bulletin.